: : another snowstorm hit Boston today. I am so tired of the snow and the cold. this has been the longest winter ever! what helps me the most on days like today is looking at all the photos from the summer. 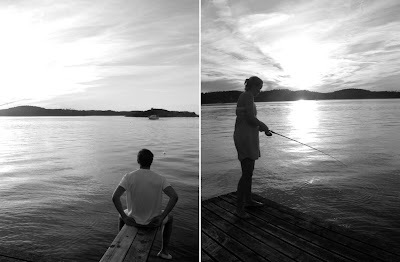 here, my lovely sister and her boyfriend fishing while the sun sets. I looooong for summer! Is that Sweden? It looks lovely. I can't wait for summer! yes, our wonderful summerhouse on the Swedish westcoast. the best place in the world! the sun ssets around 11 PM. wow. that looks like such a glorious place! Ah! You live in Boston - I can't tell you how glamorous that sounds to a person from Sydney! Still, it must be very inconvenient having all that snow.